Do you have a Ring of Solomon psychic marking? 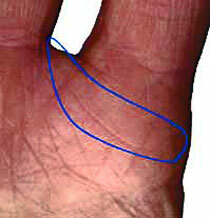 A person with this psychic palm line will not be misled by other people. A straight Ring of Solomon. When the line is flat and straight, it shows that logic is used to find the truth in others. If you have this flat type psychic line, trusting the first impressions on what you think about a person will usually be accurate. A curved Ring of Solomon. A curvy line indicates that emotions play a major part in seeing the truth in others. If you have this curvy type psychic line, trusting your first "gut feeling" about a person will usually be accurate. When the Ring of Solomon forms one side of a box below the Jupiter finger, it is the sign of a natural teacher. She or he will naturally fall into the role of teacher most easily. Teaching others will come naturally.